As I have been saying for over a year we are still experiencing very low solar flux values. It makes for good stable conditions for FMT's on 160 and 80 meters, but not as much fun on the higher bands for contesting and DXing. It was good to see more new guys participating again this FMT. N8OB OH I had to hurry home from the Radio Club meeting to check things out. Good signals this evening. WA4FJC VA Good signal on 80 M. Pretty weak on 160 M. Keep up the good effort with FMT's. WD6CMU EB 1st FMT. IC-7000, Edirol UA-25, Spectrum Lab. Trimble Thunderbolt + PTS-500 for reference. K6APW EB The 160M in and out of noise, also unstable "birdie" QRM. K5CM 80M pretty stable first half of measurement period. Signal S4 to S7. W6OQI signal showed a lot of QSB, S4 to S9. Another "birdie" under the signal. W6OQI LAX Strong S9 signal on 80 meters. 160 meters was only S2 to S3 here in Southern California. K6HGF LAX Thanks for the FMT. K1GGI EMA Good sigs from K5CM on 80, fair on 160. W6OQI was S3 or so. Hope everybody comes within a Hz. KG0HY NE Very bad conditions, but still fun. Receiver is a ICOM R75. Calibrated with homebrew 4MHz crystal controlled oscillator. Used a Heathkit oscilloscope. Dipole antenna is 100 feet, up 20 Feet. DE KG0HY, Casey. WA1ABI RI Very good conditions tonight. Thanks Connie and Marvin. N3FG EPA I lost my 80M figures. Oh well. Thanks again for a fun event. W9TJ IL Good signals but some fade on W6OQI. Doppler was mild through the day but somewhat unstable on WC. Minor problems with equipment and antenna but prevailed. Some of the best condx on WWVB both midnight and noon calibration periods. Again, thank you for the opportunity to participate. KD2BD NNJ Very good signals were received in NJ from Connie on 80 while 160 was significantly weaker. Marvin managed to stay above my noise threshold for most of the keydown period. Thanks for another great FMT experience! K5PA STX Good signals. 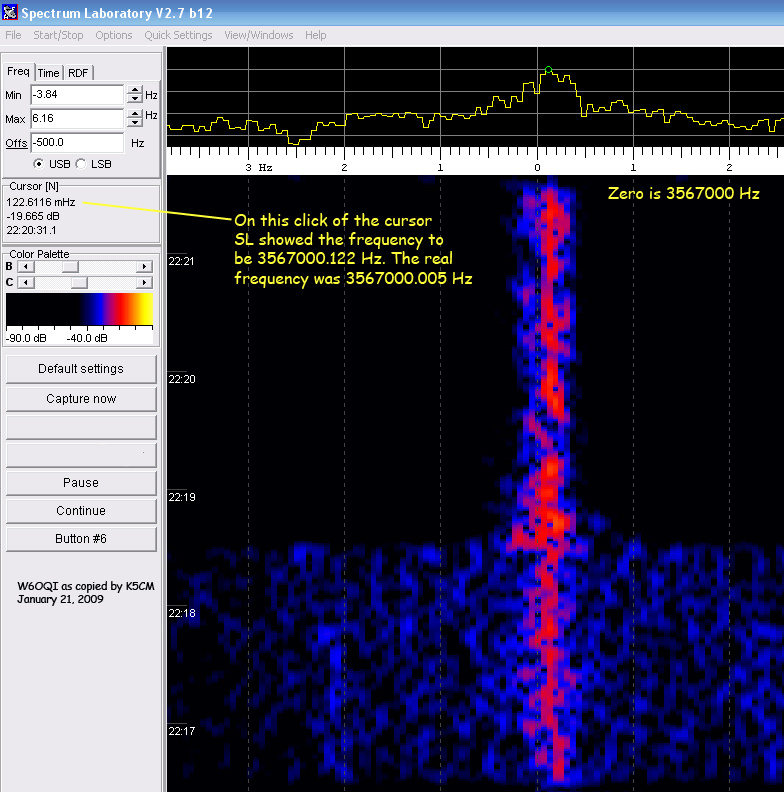 Using Icom756 and software is Spectrum Lab. W1PW AZ Was not able to find the 160 meter signal this time. Thanks Connie and Marv for running these tests! N3UC VA Using HPSDR Mercury with Custom Firmware locked to Z3801 GPS. 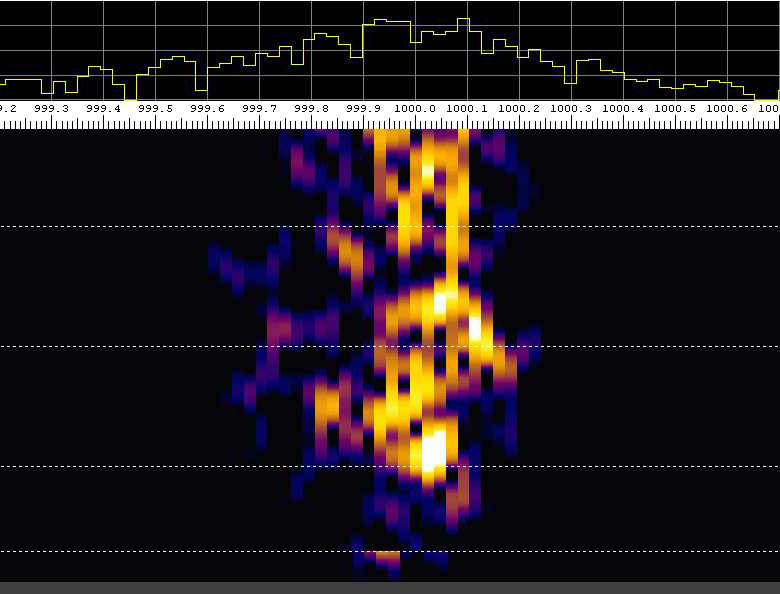 PowerSDR for receive to VAC to SpectrumLab. AF9A IN S5 to S7 signals this time. Thanks! W3JW VA Signals were not quite as strong as in recent Sudden FMT's but easily in the useable range. Doppler spread, particularly on 80 meters, was less than in recent tests. Thanks to you and Marvin for your efforts to put these signals on the air. KE2N VA Looked like drift on 80m. Using HPSDR Mercury for the first time. K5CM OK Marvin's signals were fair to good tonight. 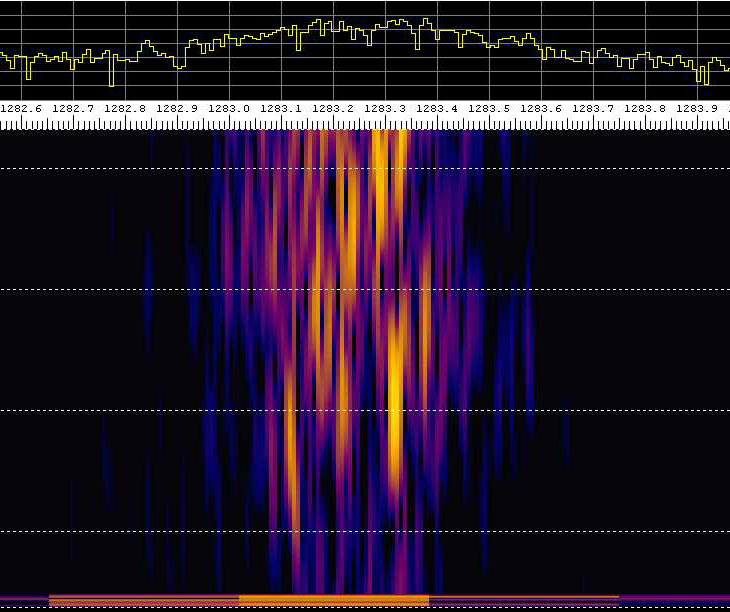 In the above spectrograph, 1043 is 3578043 Hz. . In the above spectrograph, 1283 is 1846283 Hz. In the above spectrograph, 1000 is 3567000 Hz. A Trimble Thunderbolt GPS frequency source clocks a HP-3336B. A 10 db transistor amp follows and drives a 12BY7 / pair 6146. Then to the final amplifier, a Tokyo Hy-Power amp running 500 watts on 160m, and 80m. There are no mixers or any device in the chain of amplifiers that might impact the accuracy of the GPS frequency source. 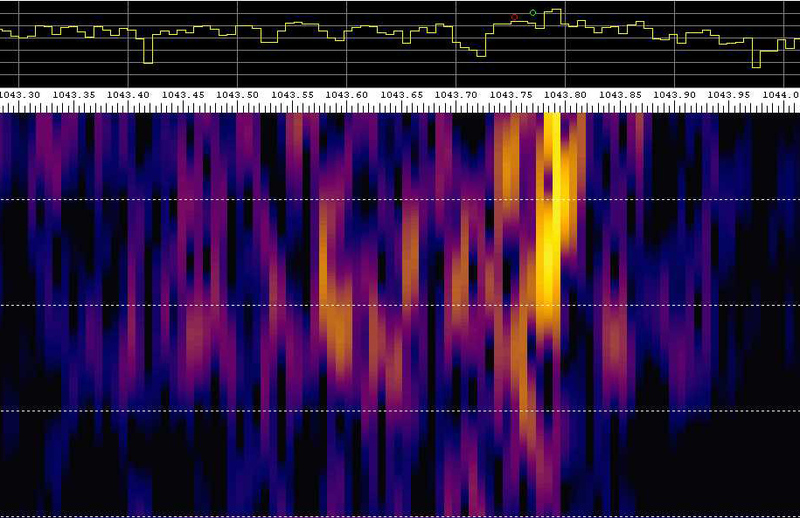 As a reality check, I periodically log the frequency source against WWVB. I monitor each transmission with a completely separate receive system to look for any instability or short term drift. The separate system is not locked to the GPS transmitting system.